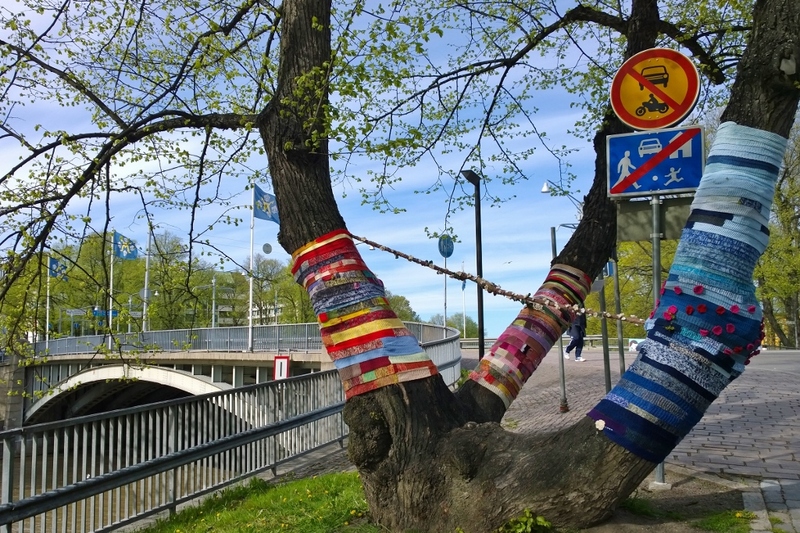 There is a two-week Knit ‘n’ tag event going on in our neighbourhood. 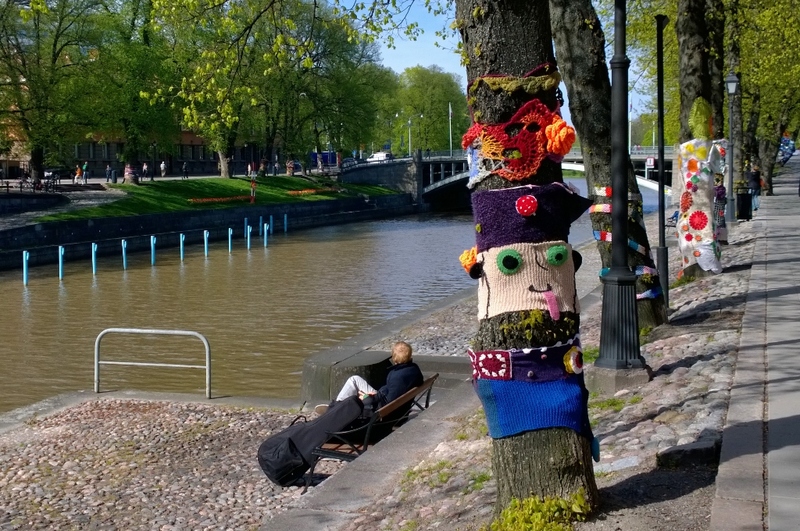 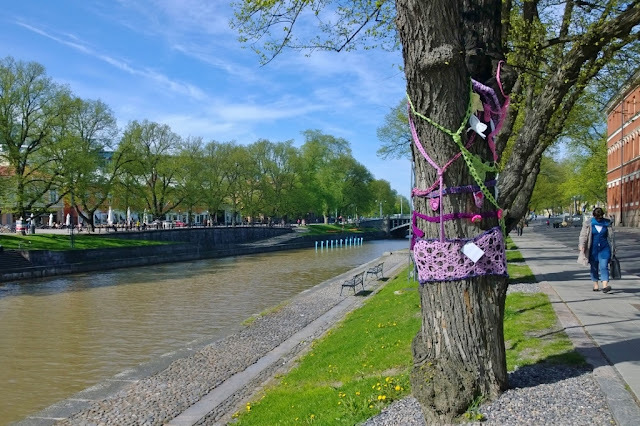 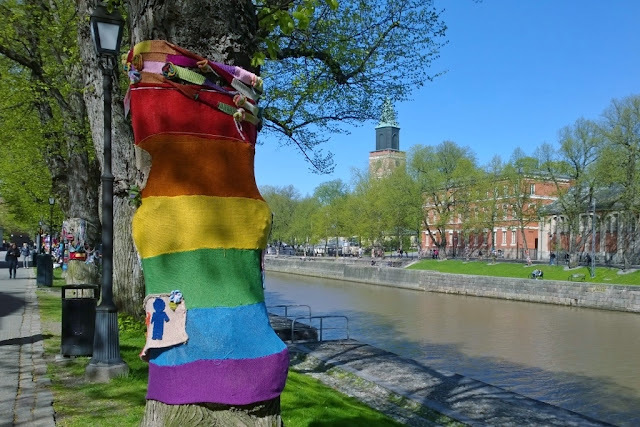 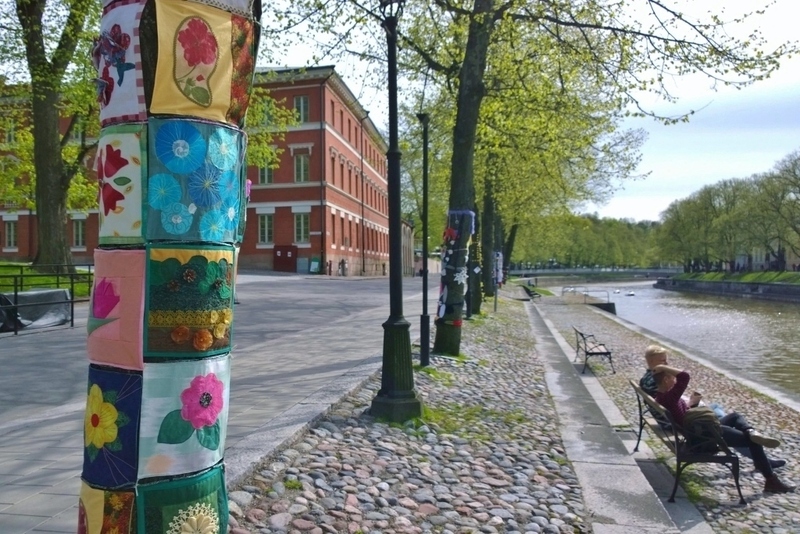 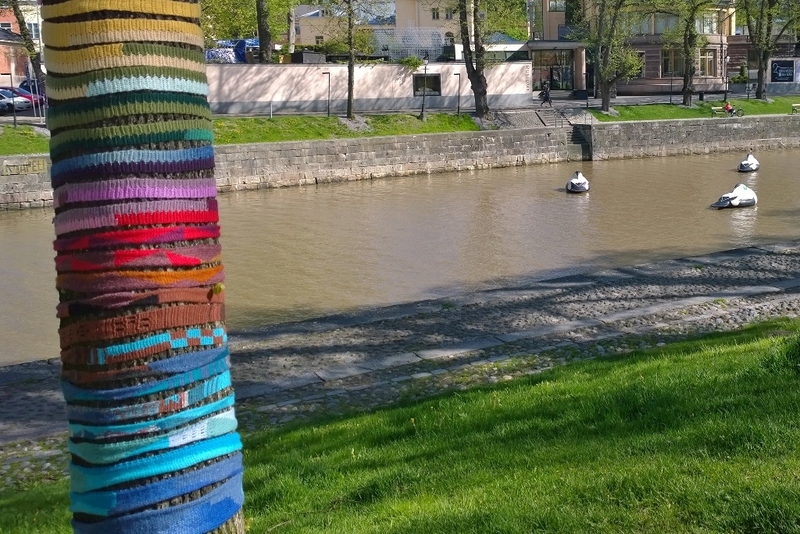 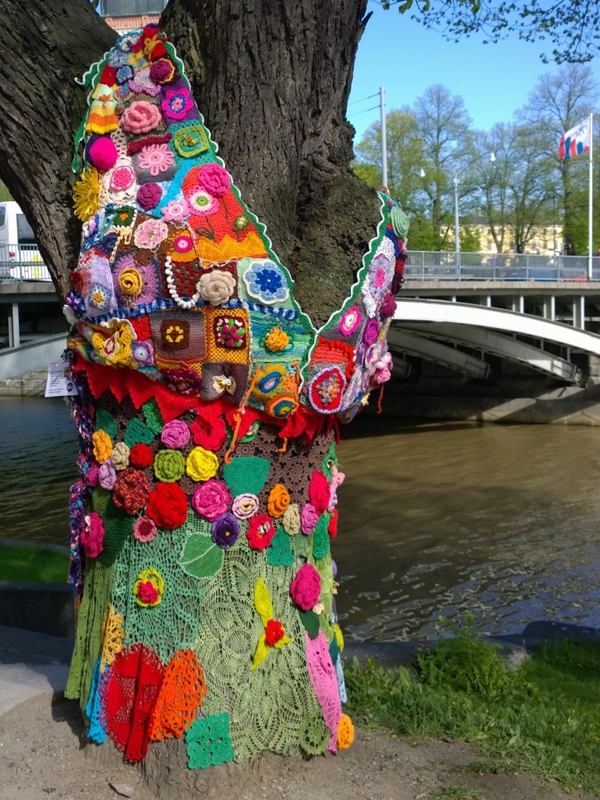 On both side of the river between the two bridges closest to the Main Library, the trunks of the trees are wrapped in all kinds of knitted, crocheted, appliquéd and quilted creations. 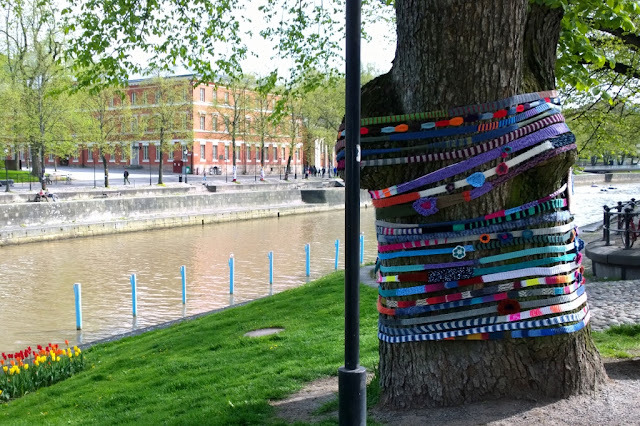 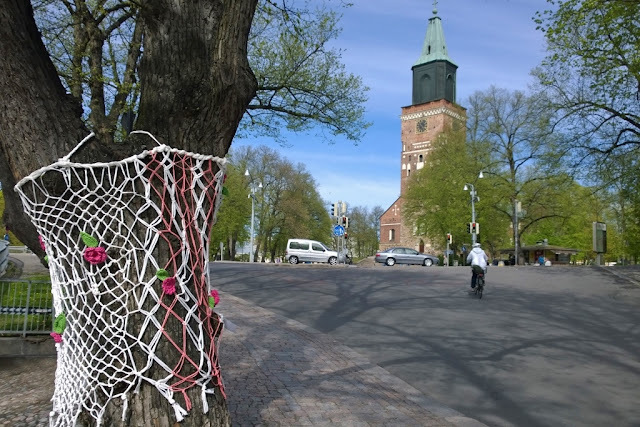 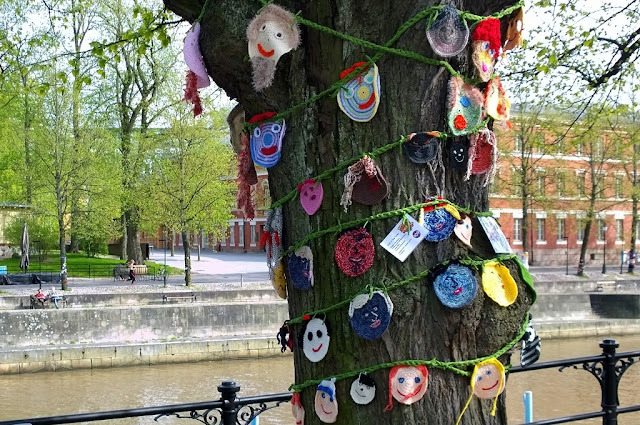 The purpose of the yarn bombing event is not only to bring some delightful urban art to the area but also to promote handicraft in all its versatility. 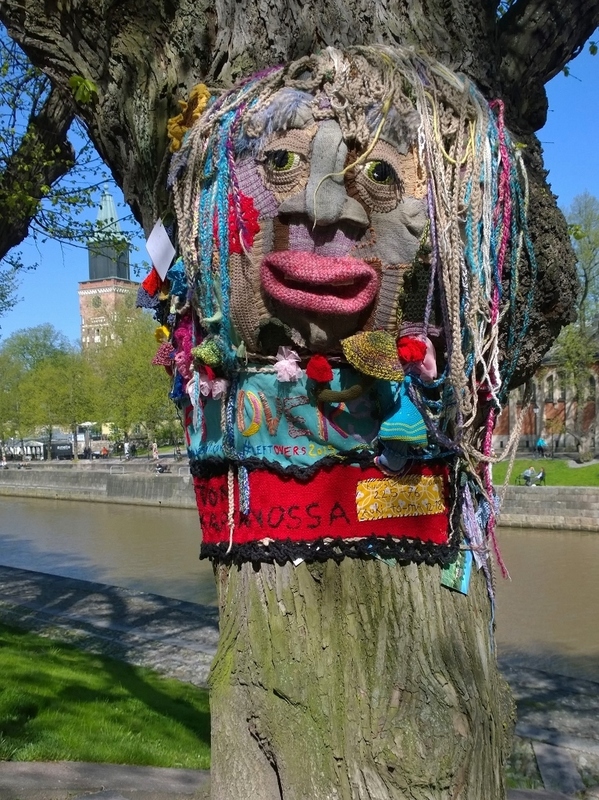 Hooray to such an event! 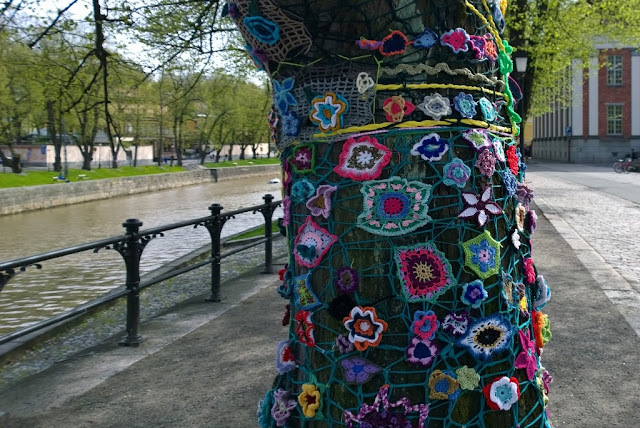 I do hope the wonderful trend of crafting will continue to grow. 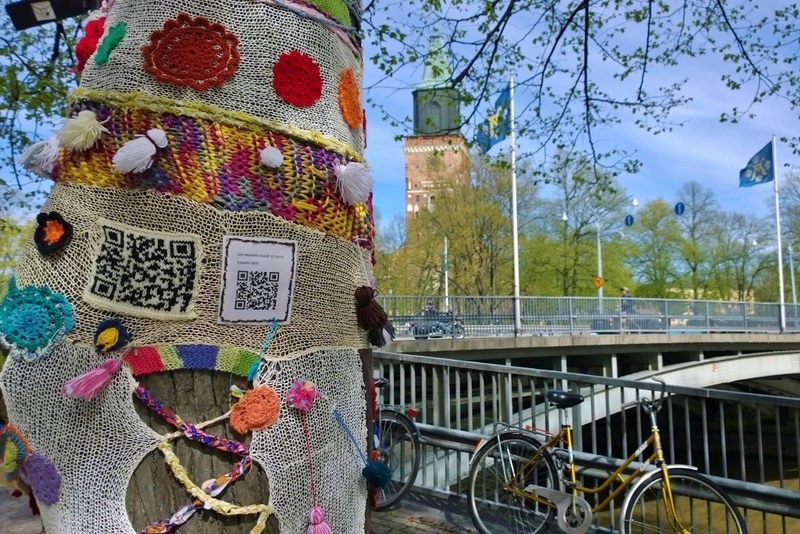 Each tree is clad by a different organisation, school, club, private group or person. I am not sure about the history of the event but I heard that a similar one took place here two years ago. This time the theme was strips, flowers and laces. 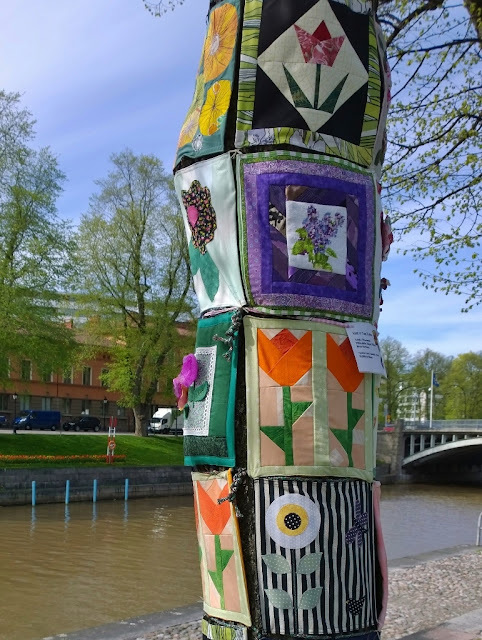 Some of the works are utilising the shape of the trunk rather nicely. 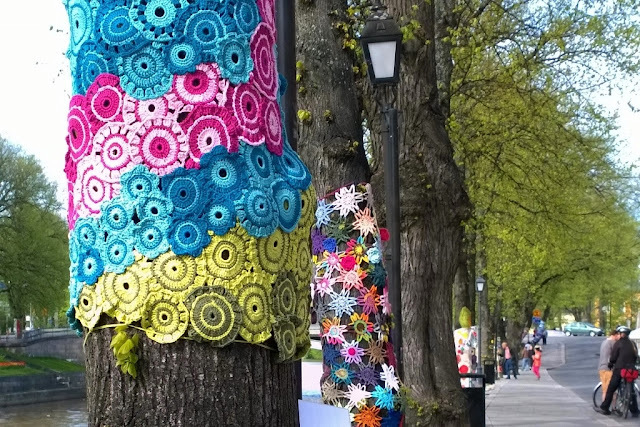 Some are making a statement while others are simply decorative. I loved especially the bright, not-too-mixed ones. 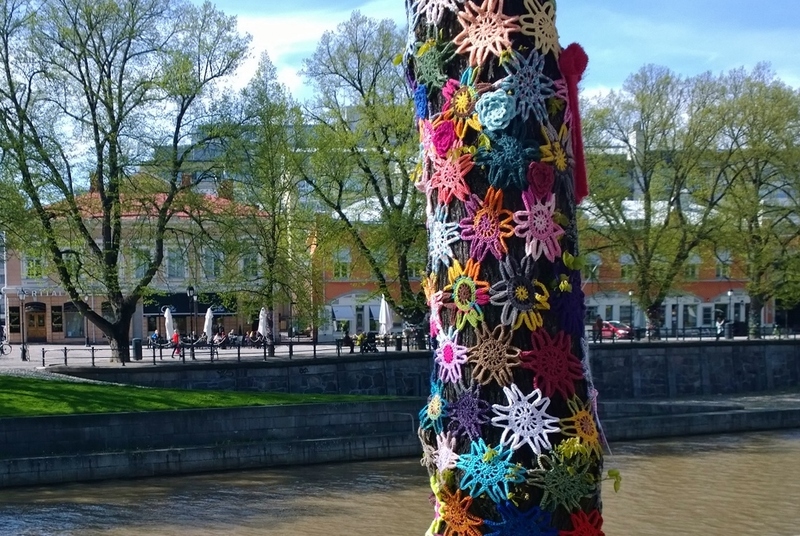 They made me want to reserve a tree for myself next time, perhaps next year. My daughter has recently gone bonkers about crocheting and could probably be persuaded to join such a project. Well, maybe next year is too soon but one of these years, definitely. Indeed. 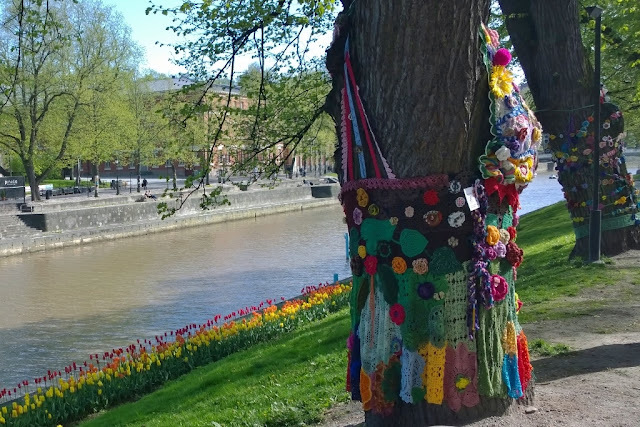 I'm sure you understand why I'd like to participate next time.